THE “PLANTADA” (MAYOS SETTING-UP) WILL BE ADVANCED TO SATURDAY. SATURDAY 7th MAY, 6 p.m. 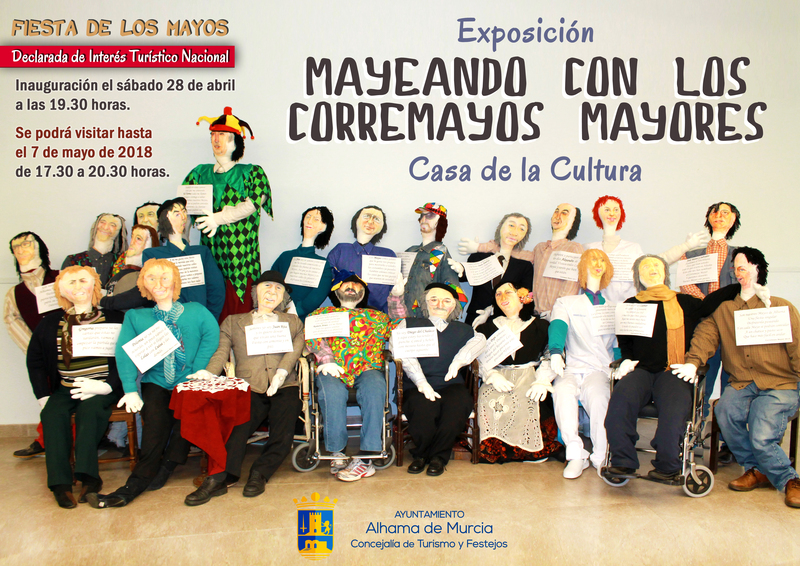 This year the “PLANTADA DE LOS MAYOS” (the setting up of the rag dolls) will be brought forward, so people who wish to visit the “mayos” set up in advance can do so from this time, all night long until Sunday evening. SIGNIFICANT INCREASE IN AWARDS: This year, make a good “mayo” and win up to 800 euros. FRIDAY 6th MAY at 10.30 p.m. Atrio San Lázaro Efrén López y Abracadabra + Riobó. SATURDAY 7th MAY at 11 p.m. Parque La Cubana. Malvariche + Los niños de los ojos rojos. SUNDAY 8th MAY at 5 p.m. Parque La Cubana. Encuentro de Cuadrillas (Meeting of traditional music bands). FOR THE FIRST TIME, YOU CAN VISIT LOS MAYOS BY BICYCLE. SUNDAY 8th , from 5 p.m. The cyclist club “Sierra Espuña” will give guided walks throughout the city visiting several “mayos”. Take your bike and enjoy Los Mayos in a different way. Departure point: Plaza de la Constitución. 10.30 p.m. 16th ALHAMA IN FOLK CONCERT, with performances by EFRÉN LÓPEZ I ABRACADABRA and RIOBO. Location: Atrio de la Iglesia de San Lázaro (St. Lázarus Church Square). LOS MAYOS TRAIN. It will visit several places where Mayos have been set up. There will be several departures throughout the day. Departure point: Avenida de la Constitución, at the Auditorium entrance. From 3 p.m. you can visit some mayos to find out about how they are being set up. 6 p.m. This year the “PLANTADA DE LOS MAYOS” (setting up of rag dolls) will be advanced, so those so people who wish to visit the “mayos” set up in advance can do so from this time, all night long until Sunday evening. 7 p.m. ZUMBA MASTER CLASS, especially adapted for the “Mayos”. Organised by Pryorem Alhama and Concejalía de Deportes. Location: Plaza de la Constitución. 7 p.m. TOURIST INFORMATION. The Tourist Office will had out a commemorative badge, maps, posters, programmes…This information service will continue on Sunday. Location: Tourist Office, Plaza Constitución 10. 9 p.m. Presentation of the “CORREMAYO MAYOR” OF THE FIESTAS DE LOS MAYOS 2016. 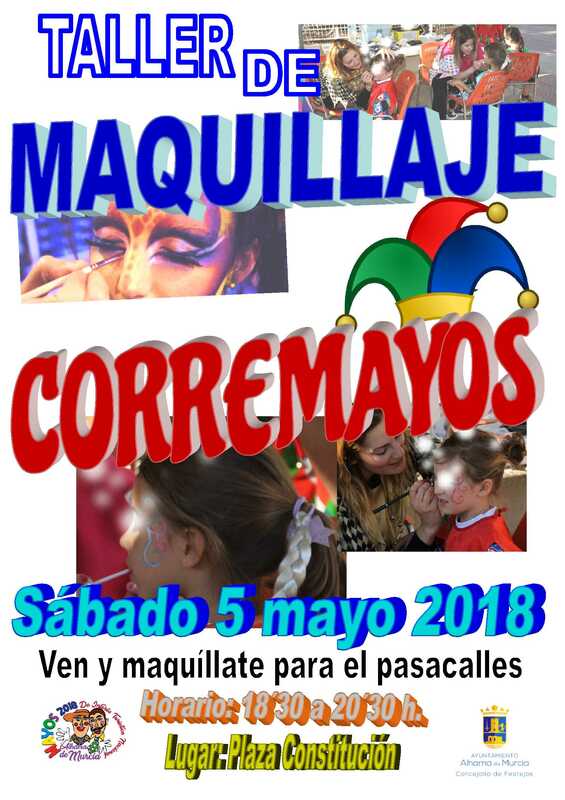 This year the designated “Corremayo Mayor” is TELEALHAMA. Location: Entrance of the Town Hall, Plaza de la Constitución. 9.15 p.m. CORREMAYOS PARADE.- Corremayos Walk around the town with music by the folk group MALVARICHE. The Corremayos gather at the Plaza de la Constitución, in front of the Town Hall, and then follow a route via: Avenida Constitución, Juan Carlos I, La Feria, Corredera, San Francisco Javier, Plaza del Nazareno, Avda. Constantino López, Rambla Don Diego and Fairground. 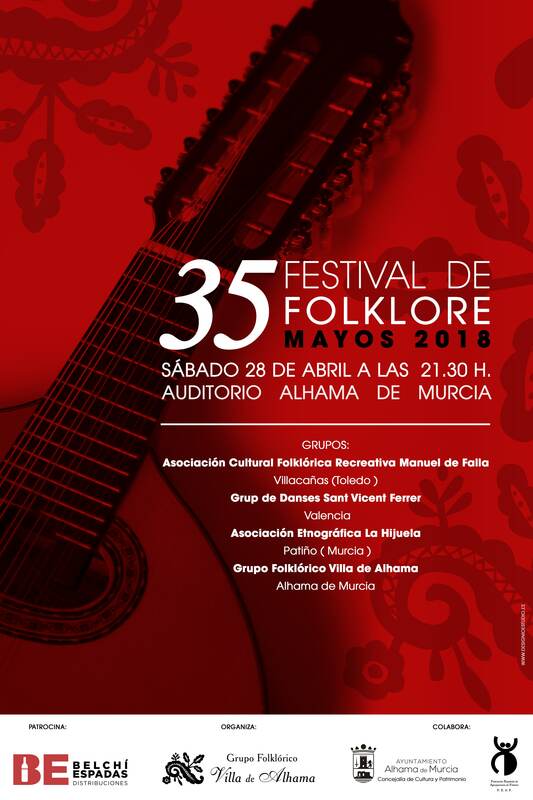 11 p.m. 16th ALHAMA IN FOLK CONCERT, with performances by MALVARICHE and LOS NIÑOS DE LOS OJOS ROJOS. Location: Parque La Cubana (the old traffic park for children). Free admission, limited capacity. “PLANTADA DE LOS MAYOS”. Setting up of Los Mayos (rag dolls) throughout the streets, squares and parks of Alhama. They can be visited until 7 p.m.
LOS MAYOS TRAIN. It will visit several places where Mayos have been set up. Several departures throughout the day. Departure point: Avenida de la Constitución, at the Auditorium entrance. 9.30 a.m. 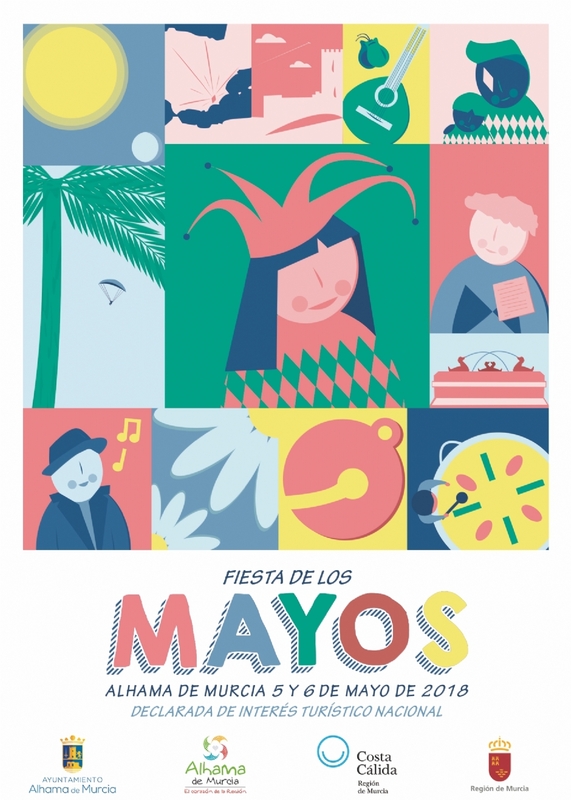 The Tourist Office will be open to deliver commemorative badge, provide information about the Fiesta, maps of Mayos and May Crosses, programmes, posters and general information. 9.30 am. Opening of the ARTISAN MARKET “ZOCO ALHAMA”, natural and handicrafted products, from 9.30 a.m. to 8 p.m. Location: Parque La Cubana. 10 a.m. Visit of the Judges to the Mayos that are taking part in the contest. 10.30 a.m. 16th Folk Concert in Alhama. ENCUENTRO DE CUADRILLAS “LOS MAYOS” (Meeting of “cuadrillas”, traditional folk music groups). The “cuadrillas” will visit different mayos throughout the morning. Departure point: Plaza de la Constitución. Participating groups: Cuadrilla de El Berro, Cuadrilla de La Costera, Cuadrilla de Aledo, Cuadrilla de Fuente Librilla, Cuadrilla de la Zarzadilla de Totana. 10.30 am. CORREMAYOS PARADE with the Alhama Charanga (brass band) “Poyavés” and the Murcian Charanga to visit the Mayos. Gathering and departure of the parade from Plaza de la Constitución (Town Hall square). During the parade, people dressed up as corremayos will be given tickets to have priority in the Giant Paella. 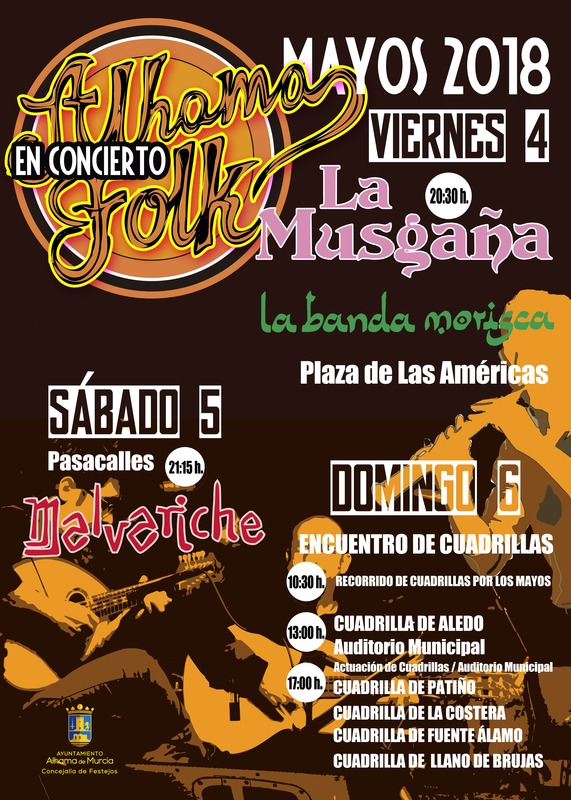 1 p.m. Alhama in Folk Concert. ENCUENTRO DE CUADRILLAS “LOS MAYOS”. Opening performance of LA CUADRILLA DE ALEDO. Location: Stage located in La Cubana Park. MAYOS ON BICYCLE. From 5 p.m., the Cycling Club “Sierra Espuña” will give guided walks throughout several streets where mayos are set up. Take your bike and enjoy the Mayos in a different way. Departure point: Plaza de la Constitución. 5 p.m. Cuadrilla de El Berro. 5.45 p.m. Cuadrilla de Fuente Librilla. 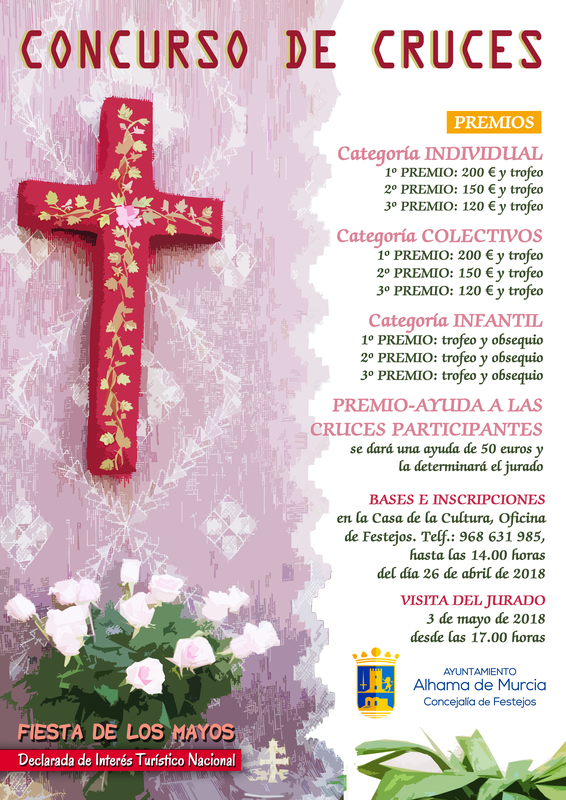 6.30 p.m. Prize giving of the Mayos and Crosses of May Contests. 7.45 p.m. Cuadrilla de La Zarpadilla de Totana. 7.30 p.m. Cuadrilla de La Costera. 8.30 p.m. Opening of the photo exhibition “Lugares de Memoria, entre la barbarie y la cultura”. Photographs by Alfonso Cerón Aledo and José Mª González Tomás. Until 3rd June. Location: Centro de Exposiciones “El Pósito”. 24th CUSTOM MOTORBIKE GATHERING. Location: Complejo Deportivo Guadalentín (Guadalentín Sports Centre, Outdoor Swimming Pools). 12 p.m. Opening of the ticket office. 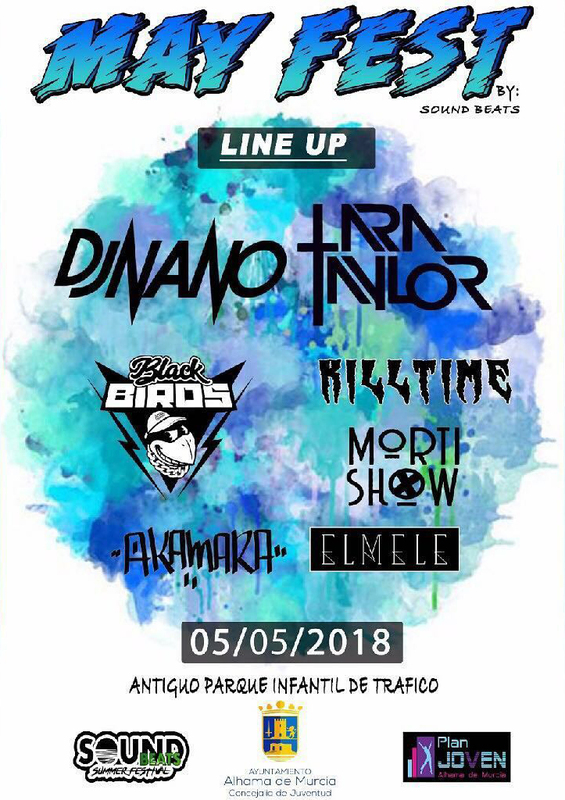 10 p.m. Live rock concerts by “Traspié” and “Moes”, with the best rock versions and his local guitar player José Antonio “El Belga”, writer of “Las Aventuras de Moriana” soundtrack. Free admission, limited capacity. 7 pm. Opening of the MEDIEVAL MARKET. From 7 p.m. to 11 p.m. Location: Plaza Constitución. 8.30 p.m. Opening of the Exhibition “Fragmentos y Evocaciones”, by Perla Fuertes. Until 12th June. Location: Los Baños Archaeological Museum. 24rd CUSTOM MOTORBIKE GATHERING. Location: Complejo Deportivo Guadalentín (Guadalentín Sports Centre, Outdoor Swimming Pools). 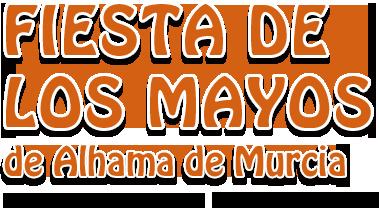 12 p.m. Live Music with “Notthingam Prisa” (Mojinos Escozíos tribute band). 4.30 pm Demostration of the “Only Wheel” technique. Enlivened by hostesses. 5 p.m. “Elvis Presley vs Manolo Escobar”. Live music show tribute to the rock king and the Spanish pop song king, by Marcos Elvis and Andrés Mendoza, great Manolo Escobar imitator. 6 p.m. El Pozo ham tasting, by the professional ham cutter José Valero. 10.30 p.m. Live concerts by “Discordia” and “Malas Compañías”, Joaquín Sabina tribute band. Free admission, limited capacity. 11 a.m. MEDIEVAL MARKET. From 11 a.m. to 2.30 p.m. and 5 p.m. to 11 p.m. Location: Plaza de la Constitución. 8.30 p.m. Opening of the exhibition “Alhama, entre la sierra y el mar” by Fernando Puche. Until 29th May. Location: Cultural Centre Plaza Vieja. 8.30 p.m. Reception of the groups taking part in the 33rd NATIONAL LOS MAYOS FOLKLORE FESTIVAL. Location: Town Hall. 9.30 p.m. 33rd NATIONAL FOLKLORE FESTIVAL LOS MAYOS 2016. Participating groups: Grupo de Coros y Danzas “San Antón”. Peña la Zaranda (Murcia), Grupo Folklórico “Raices” de Cenicientos (Madrid), Coros y Danzas “El Miajón” de Móstoles (Madrid) and the folklore group “Villa de Alhama” (Alhama de Murcia). 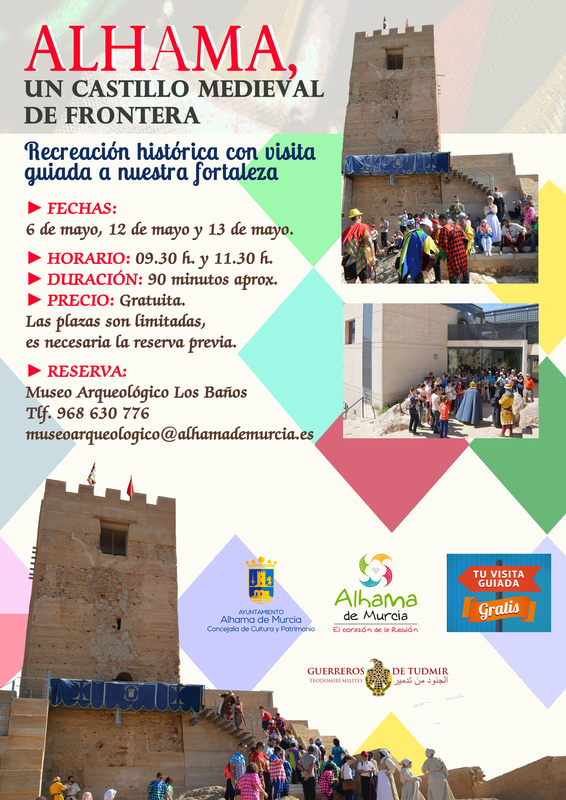 Organised by folklore group “Villa de Alhama”. Free admission, limited capacity. Location: Auditorio Municipal “Tierno Galván”. 24th CUSTOM MOTORBIKE MEETING. Location: Custom Alhama Motor Club Head office. 9 a.m. 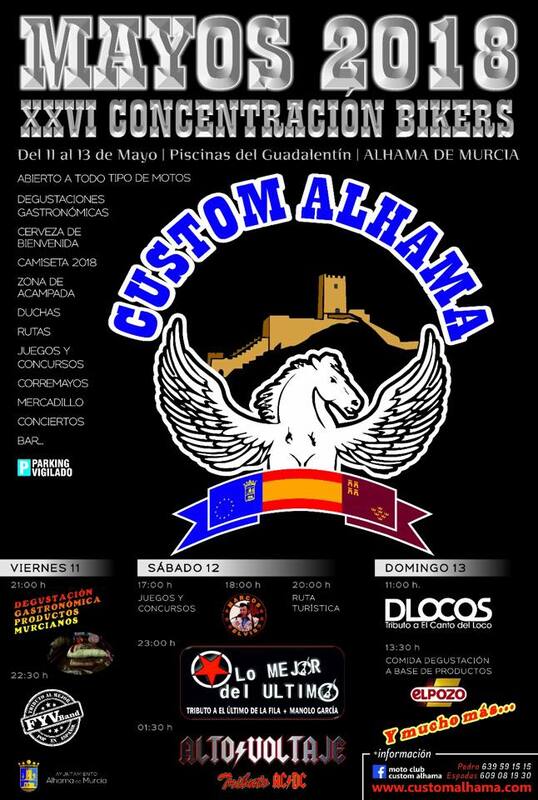 Opening of the Custom Alhama Motor Club Head Office, where all the events of the motorbike gathering will be held, except the market which will remain in the Guadalentín Sports Centre. Gastronomic tastings with “migas santeras”, paella and barbecue. Unregistered people may still participate by paying for drinks and food. It will be enlivened by the “official” hostesses. Live music with “Marcos Elvis” and “Rock para 4”. 11 a.m. MEDIEVAL MARKET. From 11 a.m. to 2.30 p.m. and 5 p.m. to 9 p.m. Location: Plaza de la Constitución. 11.30 a.m. 24th “LOS MAYOS” RICE COMPETITION. Location: Recinto Ferial (Fairground). The Town Hall will provide paella, soft drinks and firewood. 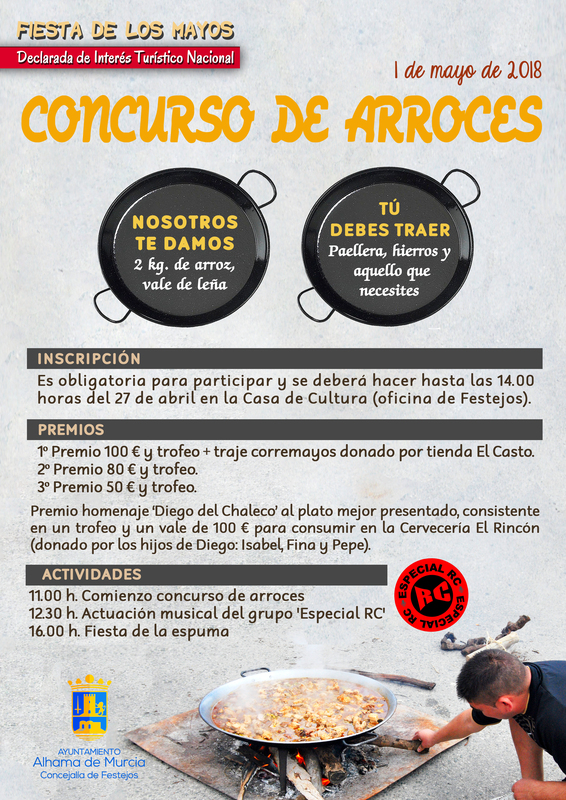 This paella-making competition will be livened up by the performances of some local music bands called “rondallas”. 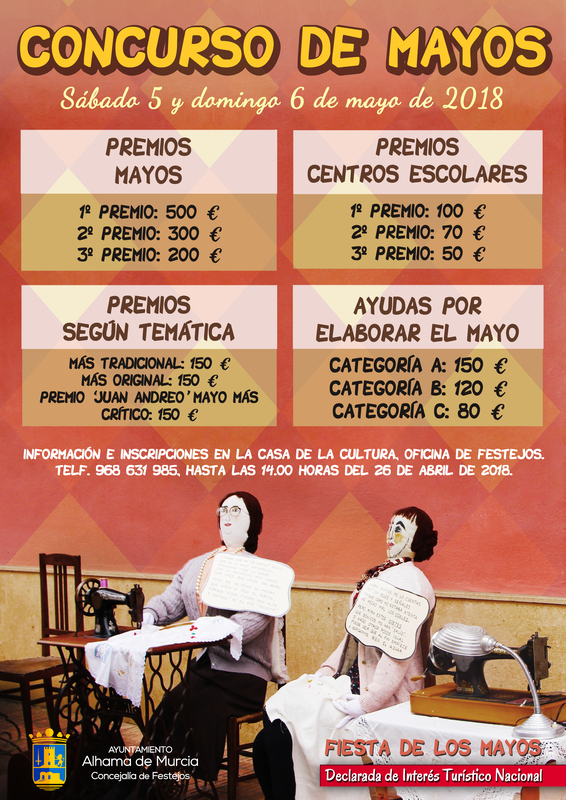 1st Prize: 100 € and a “Corremayos” costume, donated by Tienda El Casto. 2nd Prize: 80 € and a trophy. 3rd Prize: 50 € and trophy. Tribute Award “Diego del Chaleco” to the best presented dish, consisting of a trophy and a voucher worth 100 € to be used in El Chaleco Restaurant and/or El Rincón Bar. Registration is at the Festivity Councillorship (Casa de la Cultura) until 29th April at 2.30 pm. - Guitar, lute and another lute-type instrument workshop (Taller de guitarra, laud y bandurria) at the Residential Home (Centro de Mayores). - (Cuadrilla) La Costera Music Group. 4 p.m. FOAM PARTY. Location: Parque La Cubana (the old traffic park for children). 5 p.m. Visit of the judges to the Crosses of May taking part in the contest. The participating Crosses will be open in the afternoon so they can be visited by everybody. 10 p.m. “Canto a la Cruz de los Mayos”. The folk group "Villa de Alhama" will sing their Canto de los Mayos to their May Cross. Location: Calle Alfonso X El Sabio, 35. 11 a.m. Training sessions of the National Motocross Championship . Location: Circuito Las Salinas. 4 p.m. Regional Premier Division Racquetball Tournament. Pre-olympic category. Location: Racquetball courts in the Industrial Park of Alhama. 9.30 a.m. Boules Competition Barrio de San Andrés Los Mayos 2016. Location: Garden of Santa Bárbara. 10 a.m. Race of the National Motocross Championship, cathegories MX125, Elite MX1 and Elite MX2. Location: Circuito Las Salinas. 10 a.m. Los Mayos Tennis Tournament. It will continue on 1st May. Location: El Praíco sports centre. 7 p.m. “Los Mayos” Night Hike. Meeting and departure from el Recinto Ferial (Fairground). Previous registration is required and can be done so on the club’s website: alhamacoym.com. Until 28th April, at 6 p.m.
8.30 p.m. “Los Mayos” Children’s Hike. Meeting and departure from Plaza de la Constitución. Previous registration required and can be done so on the club’s website: alhamacoym.com. Until 28th April, at 6 p.m. Children must be accompanied by an adult. 4 p.m. Regional Honor Division of Racquetball Tournament. Pre-olympic category. Location: Racquetball courts in the Industrial Park of Alhama. 5 p.m. Paragliding Festival. Location: Urbanización Nueva Espuña and Vereda de los Secanos. 5 p.m. Bicycle route to visit Los Mayos. Departure point: Plaza de la Constitución. 5 p.m. “Mayos 2016” Paddle Tennis Tournament. Gold, Silver and Bronze categories, as well as a female category. It will continue on 14th and 15th May. Location: Polideportivo El Praíco. 9 a.m. “Los Mayos” Racquetball Opening and the doubles category. Location: El Praíco sports centre. 6 p.m. 2016 DEPORTIMAYOS. Sports games and workshops for children to play and learn about different sports. Location. Calle Paraguay, opposite the Indoor Swimming Pool. 9.30 a.m. 18th Los Mayos Judo Tournament. Location: Pabellón Municipal Adolfo Suárez (Municipal Sports Centre, Rambla D. Diego). 3.30 p.m. 6th Championship of synchronized Swimming “Sincromayos”. Location: Indoor Swimming Pool (Calle Paraguay). 9 a.m. Racquetball Absolut Open “Los Mayos”, pre-olympic cathegory. It will continue on Saturday 28th May and Sunday 29th May. Location: Polideportivo El Praíco and Industrial Park Racquetball Courts, depending on the number of participants. 10 a.m. 6th “Los Mayos” Indoor Football 8 a-side Tournament. Three different categories for children. Location: Complejo Deportivo Guadalentín. 10 a.m. 9th Football 7 a-side Marathon, 7th Memorial “Kubala”. Different age categories on Saturday and Sunday. Location: Complejo Deportivo Guadalentín. All the proceeds from the sales of the tickets will go towards the Spanish Association against Cancer. 9.30 a.m. Petanque Contest “Los Mayos” (La Carrasca). Location: Petanque lanes of La Carrasca.